At about 92 million kilometres from Earth, the smallest planet in the solar system is expecting company. 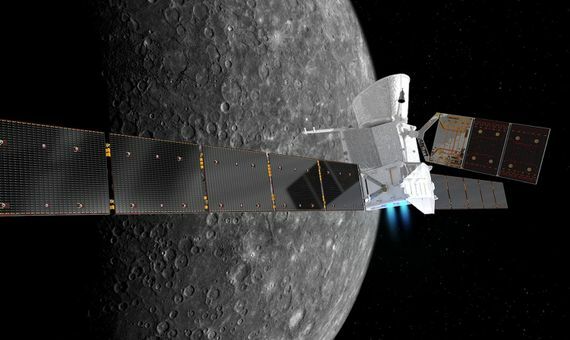 Three years after the MESSENGER spacecraft finished its mission orbiting Mercury by slamming into the surface, the BepiColombo mission of the European Space Agency (ESA) and the Japanese Aerospace Exploration Agency (JAXA) will take its place. The spacecraft will be launched from the spaceport of Kourou (French Guiana) sometime between October and November this year, but it will not reach Mercury until just over seven years later. Awaiting the craft will be a world as fascinating as it is enigmatic. Artist’s impression of the BepiColombo spacecraft in cruise configuration, with Mercury in the background. Credit: ESA/ATG medialab, NASA/JPL. As it is located so close to the Sun—between 47 and 70 million kilometres—with extreme temperatures ranging from 430ºC during the day to -180ºC during the night on its surface, only two missions have managed to reach the rocky planet, both from NASA: the aforementioned MESSENGER and Mariner 10, which flew over the surface for the first time on 29 March 1974. Mauro Casale, a scientist at the ESA and the person responsible for the BepiColombo mission, tells OpenMind that: “It’s a very long trip and a lot of energy, i.e. fuel, is needed to get there.” The curious name of the mission pays homage to the Italian scientist Giuseppe “Bepi” Colombo, whose calculations on Mercury made the success of the Mariner 10 mission possible. One of the biggest challenges for the spacecraft that have approached the planet is the enormous gravity that the Sun exerts, which complicates the establishment of a stable orbit around it. Casale explains that BepiColombo will use electric propulsion and xenon, but that will only provide 57% of the total push needed to get there. The remaining 43% will come from the energy of the gravitational field of the Earth, Venus and Mercury. 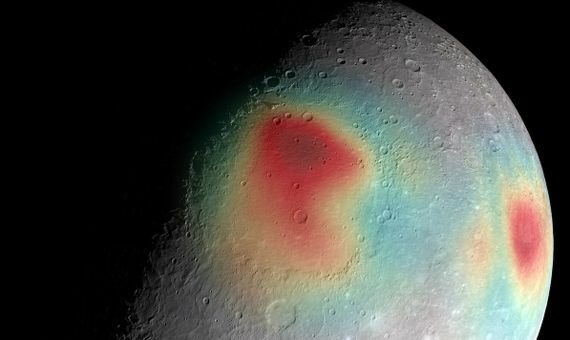 Mercury’s gravity anomalies are depicted in colors. Red tones indicate mass concentrations, centered on the Caloris basin (center) and the Sobkou region (right limb). Credit: NASA/Goddard Space Flight Center Science Visualization Studio/Johns Hopkins University Applied Physics Laboratory/Carnegie Institution of Washington. When it arrives at its destination, “all of the fuel available on board will be used just to enter the final orbit and there will be no fuel left for orbit control later on while orbiting the planet,” stresses the scientist in charge of the mission for the ESA. 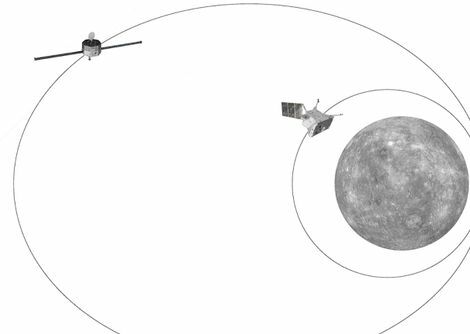 BepiColombo is composed of two probes: the Mercury Planetary Orbiter (MPO) and the Mercury Magnetospheric Orbiter (MMO). Neither of them will land on its surface, although they will end up colliding with it once they have finished their work. According to Casale, at an earlier planning stage a third probe, the MSE, was contemplated, which was to be landed on the planet, but the high cost finally led to the abandonment of that idea. In any case, the two current orbiters will provide unprecedented information about the planet. The Mercury Planetary Orbiter (inner orbit) and the Mercury Magnetospheric Orbiter (outer orbit), in their elliptical polar orbits around Mercury. Credit: ESA/ATG medialab. The MMO is equipped with instruments to measure plasma, magnetic signal and dust, while the MPO will analyse the magnetic field, gamma rays, X-rays and the exosphere, among other parameters. “We have detailed chemical data from MESSENGER for the northern hemisphere but almost no data for the South of the planet,” says Olivier Namur, researcher at the Department of Earth and Environmental Sciences at the University KU Leuven (Belgium) to OpenMind. Having this information will help us to better understand what the composition of Mercury is like. This tiny planet—just a little bit bigger than the Moon—has no atmosphere. Instead it has a thin layer, the exosphere, which is composed of oxygen, sodium, hydrogen, helium and potassium. What amazes geologists is its surface, dotted with numerous craters. 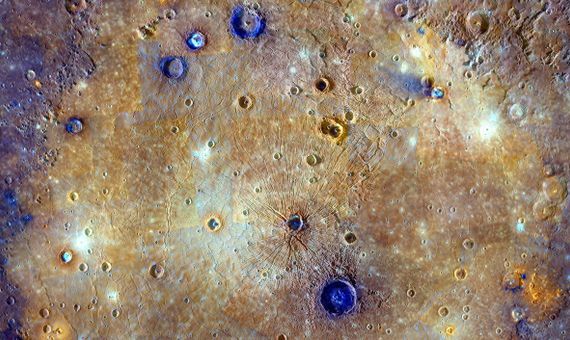 “There’s the Caloris impact basin—a huge depression in the northern hemisphere bigger than western Europe that formed when a large asteroid smashed into Mercury almost four billion years ago,” explains Paul Byrne, a planetary geologist at State University of North Carolina (USA), to OpenMind. Caloris basin has been flooded by lavas that appear orange in this mosaic. Credit: NASA/Johns Hopkins University Applied Physics Laboratory/Carnegie Institution of Washington. Another characteristic feature is in its interior, specifically in its core, which represents 70% of the volume of the planet, according to Namur. In addition, it does not have iron on its surface, since it is formed by volcanic lava, rich in sulphur. Geologists and other researchers are waiting impatiently for BepiColombo to reach its goal. Thanks to its probes, we will have data about the nucleus and the crust of the planet and also about the composition of its surface and its exosphere. In addition, the topographic data will serve to confirm that Mercury is tectonically active. Despite the high temperatures that are reached on its surface, it seems that some craters contain frozen water, those located at the poles with areas of permanent shade. The mission also hopes to test Albert Einstein’s theory of general relativity, which, among other things, implies that the greater the velocity of the body and the field of gravity in which it moves, the greater the deviations. “Mercury is therefore an excellent laboratory for fundamental physics,” maintains Casale. We will have to wait about eight years before we can put it to the test.